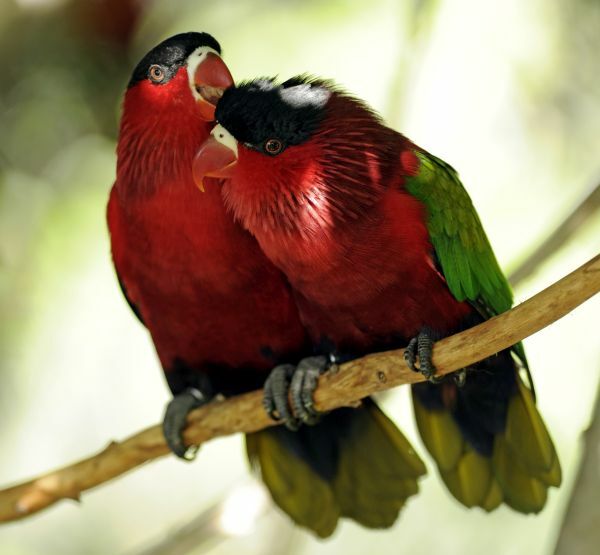 The breeding of psittacine birds encompasses a whole range of knowledge. Developing and mastering them is what turns this activity into an authentic passion. Our daily commitment and dedication to parrots implies knowing and learning from them in order to find the welfare of our birds. Some species are considered easy to care of and to breed. They reproduce easily and their offspring has higher survival options. This is the reason why the long experienced breeders of the so called lovebirds (Agapornis sp. ), the name comes from their strong and long pair bonding, are aware of the difficulty of good breeding results. At Loro Parque Fundación we pay the same attention to the rarest, as well as to the common species, since both are of equal importance. At the end of 2016, we informed about the first breeding success of the Northern Rosella (Platycercus venustus). We could observe the behaviour between parents and chicks. Through Biography we have verified that this species has certain peculiarities: The young birds are quite sensitive and nervous. We could observe this through their sudden flights. Another peculiarity is their bad incubating egg-laying or interrupted reproduction. Therefore, the conservation team applied in the following season, several auxiliary measures, which resulted in 5 juveniles, 4 of them raised by their parents and one in hand-breeding. The large parakeets (Pyrrhura cruentata), also known as blue blue-throated parakeet or red-eared cornure in English, had good breeding results. The bounded couples are now beginning to raise their own offspring without any help. We got 8 chicks of different genetic lines that were bred by their corresponding parents. The five male and three female chickens boast beautiful plumage throughout their behaviour, which is different from other Pyrrhura genus. An also remarkable event has been the breeding of our mitred parakeets (Psittacara mitratus). This species used to be very frequent in the European aviaries. At the present it is difficult to find a stable breeding for this species, as well as for other of its same genus. This is the reason why we are delighted to see how our four chickens are growing at the breeding station of Loro Parque Fundación and how their faces are acquiring the red colour of their parents. 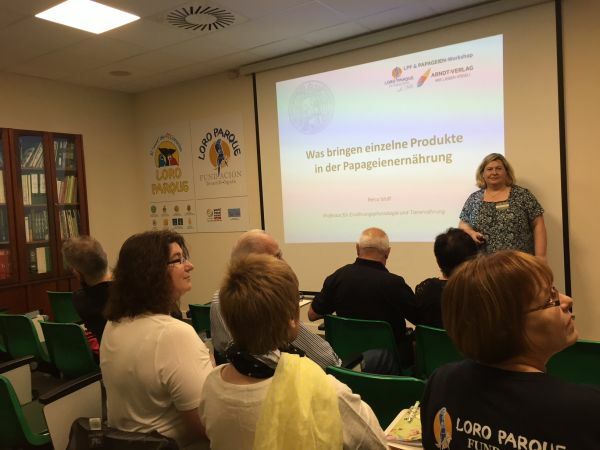 At the end of the year 2017, the magazine PAPAGEIEN organized together with Loro Parque Fundación a Workshop in German language for expert breeders. 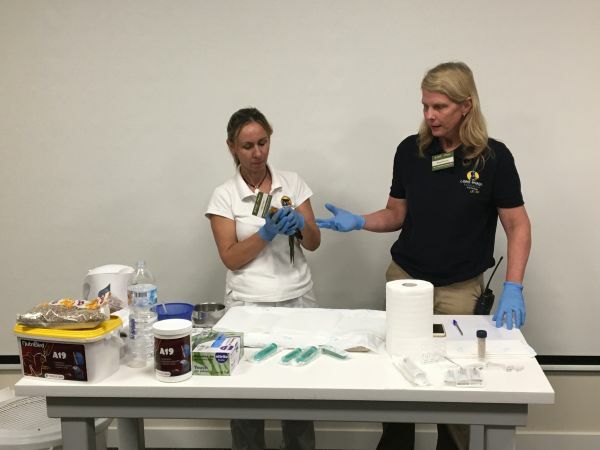 The interactive workshop took place at the facilities of Loro Parque Fundación where top-class speakers, like the important Professor Dr. Petra Wolf, exchanged knowledge and experience on nutrition and veterinary. The participants also contribute with their experience achieving contrast and opinion among all the participants. 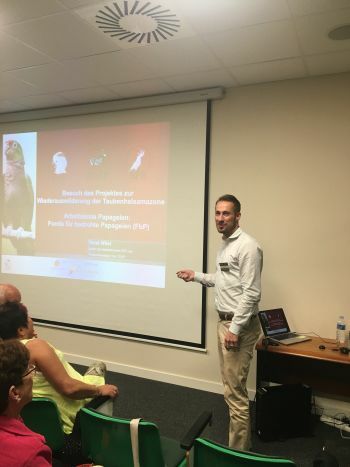 Likewise, Professor Dr. Michael Lierz of the University of Giessen, in Germany, who is a regular contributor to the Loro Parque Fundación, explained the importance of good veterinary assistance in any breeding nucleus of parrots, as a key to success in obtaining better results and guaranteeing the health of the species in care. 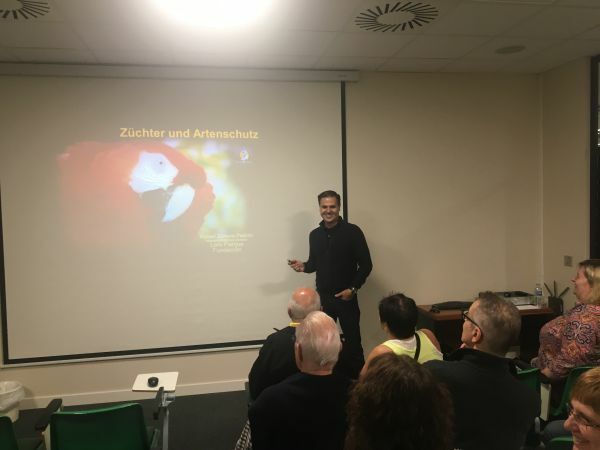 Our team at Loro Parque and Loro Parque Fundación was in charge of exposing useful topics for the attendees, such as the real situations of parrots in the wild as opposed to those who live in controlled environments. 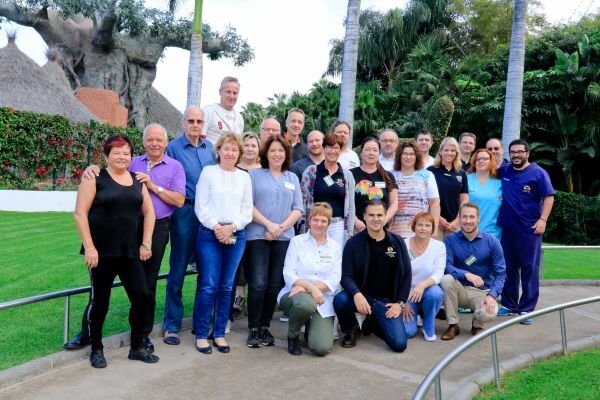 They explained the conservation and management work of Loro Parque as a modern zoo, as well as the important conservation goals of the breeding station. Our aim is to protect species that we achieve throughout education programs and through our in-situ conservation projects. 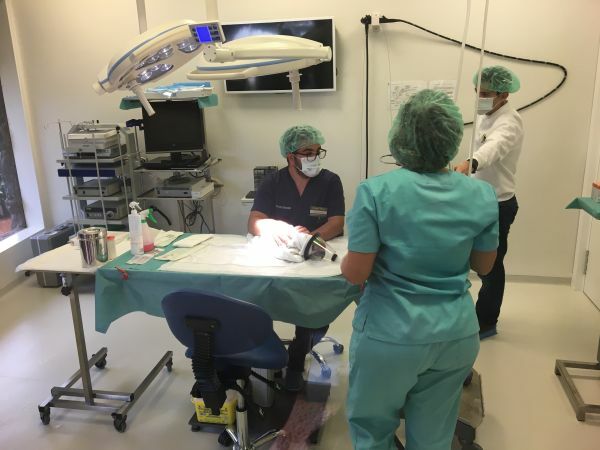 The workshop participants were witness to a live operation that took place in the clinic of Loro Parque Fundación by our veterinarian Nuhacet Fernández. The workshop offered a full program leaving us with very good sensations. 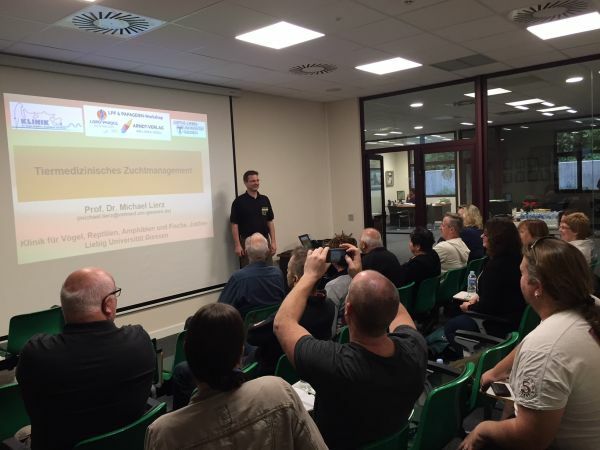 We hope to welcome soon again important breeders, such as Mr. Horst Lehmann who attended this workshop for his thirteenth time, or the well-known Heinz Weschenfelder. Both assured us to continue attending the coming workshops, as well in the upcoming International Parrot Convention in September 2018. 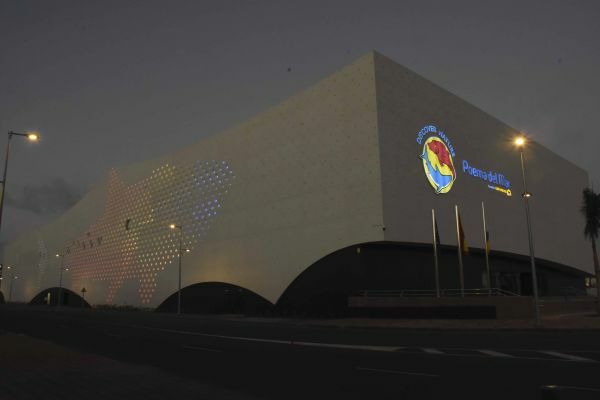 The inauguration of the aquarium “Poema del Mar” was also an important event. This unsurpassed aquarium is located in the neighbouring island of Gran Canaria and belongs to the Loro Parque group. It offers a wide range of aquatic species in a unique environment. Loro Parque Fundación will use these facilities to continue their research and advanced educational programs of the marine world, but also the amateurs of parrots will find here pleasant surprises. 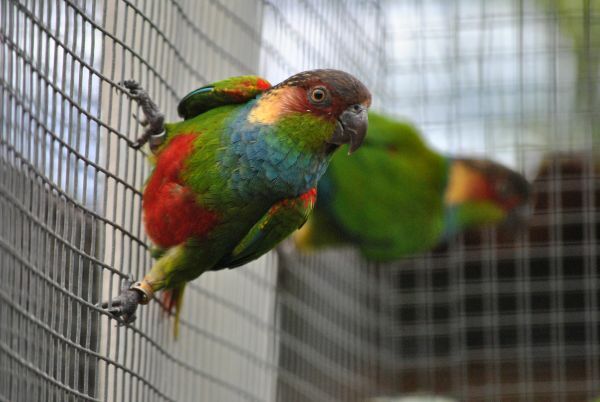 We continue working these months with great enthusiasm in the preparations for the IX International Parrot Convention. We are receiving a positive response from our most loyal members, who already registered and marked this unique event on their calendar, which is going to take place in September 2018. We share this illusion and look forward to welcome the most important meeting for parrots lovers in order to do what the most like: to talk about parrots!